When Midnight was first allowed to walk around the ranch, what he wanted most of all to do was see and converse with other horses. All up and down the lane, he stopped to check in with his neighbors. He stopped for a long time near the pasture, across the fence from the hay bale where all the geldings hang out. It wasn’t long before the boys came over to say hi. 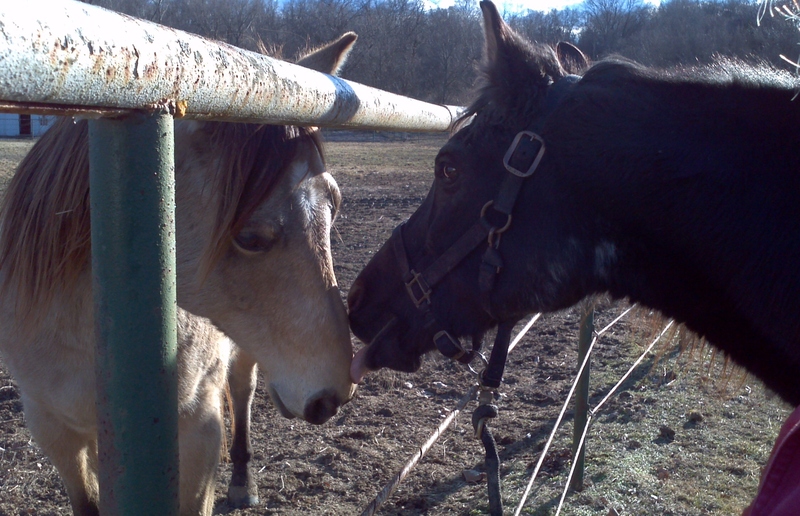 I was so touched by the greeting Midders had for his old friend Galahad. Here’s the video. This greeting went on for many minutes, and what was so surprising and memorable was Galahad’s response. My big boy is usually playful and boisterous, and a very lively game of bite-face (usually followed by run-and-chase) is his favorite pastime. But on this afternoon, with Midnight, he was so gentle and loving that my heart just melted.